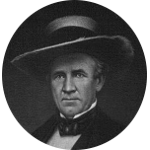 Sam Houston was an American politician and soldier who was instrumental in securing Texas independence from Mexico. He was the 7th Governor of Tennessee and he resigned from the office after his wife left him amid rumors of alcoholism and infidelity. In 1832 Sam Houston headed to Texas which was still a part of the Mexican state of Coahuila and quickly became embroiled in the politics of the area. On March 2, 1836, Sam Houston signed the Texas Declaraton of Independence and was selected as the Commander-in-Chief of the Texas Army. Four days later Mexican forces led by Gen. Santa Anna massacred the defenders of the Alamo. Less than two months later, Texas forces led by Sam Houston would defeat Santa Anna's forces at the Battle of San Jacinto. The defeated Santa Anna was forced to sign the Treaty of Velasco granting Texas Independence. Sam Houston served as the first and third Presidents of the Republic of Texas. In 1845 the United States annexed Texas into the Union as the 28th state. Sam Houston was elected as a U.S. Senator from Texas. Just before the start of the Civil War he was also the 7th Governor of Texas. Sam Houston's mother was Betsy Paxton. So it is no surprise to find that Sam Houston is related to a few famous Paxtons. These include Confederate Army General Elisha F. Paxton, actress Sara Paxton, and actor Bill Paxton. Ironically Sam Houston is portrayed by his cousin Bill Paxton in the History Channel's miniseries Texas Rising that aired in 2015.